good old betty crocker, loved the almond extract in them, powdered sugar icing in baggies snipped in the corner to make it easy for the kids (and me) to decorate. all was well until micah squeezed his baggie tight and then “didn’t hear me” when three times i said not to bite it. oh well. and a new name: because i had some “credits on my account” i could add a domain name to my blog…so now my blog is prairiedaze.com. kind of cool though i’m not really sure what it means because you can still access it at the old address, but whatever. so i guess all you readers don’t do anything diffferent unless you want to type it in for fun. What does “credits on your account” really mean?? Congrats on the domain name! 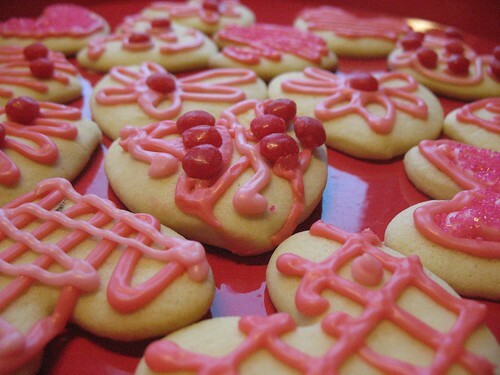 Loving the valentine cookies. I need a heart shaped cookie cutter. That’s pretty close to “pink overload!” :-) They look absolutely scrumptious! Any left for Valentine’s Day? I totally heart your new domain name!! Of course I can’t see the pics unless I wait a few hours for my computer to upload them, but I KNOW they are breathtaking. I love that you have your very own domain name!! I don’t know what it all means either, but it seems very cool. What I love is that you spelled “Valentine” incorrectly, which reminds us all that you are human, and not always as perfect as your blog…..
good to be “shluntcy” together! These look professional! 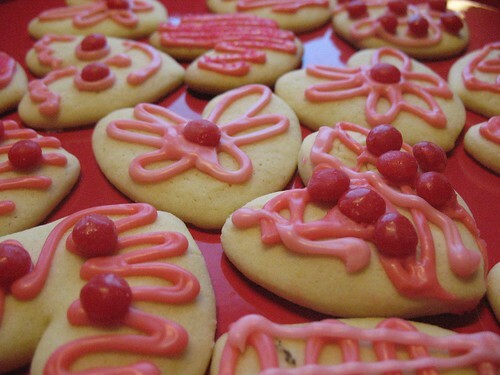 I wish they were sitting all spread out on my kitchen counter today! I totally heart your new domain name…seems like I should say Congratulations or something?? ?